Hall of Fame plaques generously provided by Takeform Architectural Graphics. 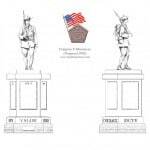 Click on the images below to view the plaques in large format. Built in 1901, this beautiful structure is listed in the National Register of Historic Places as of 1995. The Sandstone used is a striking deep pink-brownish color. The famous architect, George Heins favored the castle-like form for this Armory and was patterned after the massive armory in Buffalo which was built several years earlier. The building of this armory, at a cost of $ 55,000 and the completion of this imposing edifice provided a grand addition to the growing village of Medina. This armory originally housed the 29th separate company of the New York State Army Guard. Company F of the New York National Guard’s 3rd Regiment operated out of this armory for almost 60 years. The building of this beautiful structure ignited tremendous pride and ceremony in the village of Medina at the turn of the century. The giant drill hall was used for athletic events and was decorated for dress balls and industrial shows. This uniquely designed church was built in 1894 by industrialist George M. Pullman, as a memorial to his wife and parents. Mr. Pullman spared no expense and chose Medina Sandstone as the building material. He chose flawless pink sandstone and commissioned Louis C. Tiffany to create numerous stained glass windows. The building was designed by Solon S. Beman in the style of Old English Gothic with Richardson Romanesque features. Its long, low horizontal profile and its arrangement added to its unique design. Beman found rough hewn locally quarried Medina Sandstone complimentary to the simple forms and heavy proportions of the Richardson style. Sandstone Ashlars were precisely cut and put together with extremely fine mortar joints. It is the best example of this sort of precision stone work locally. Likewise, there are more details cut into the stone for architectural embellishment than any other building in Orleans County. Final construction costs were $64,000. Today, in 2013, this beautiful sandstone structure is still being used as a Unitarian Universalist church. The massive complex of the former Buffalo State Hospital was designed by architect Henry Hobson Richardson and the surrounding grounds by Frederick Law Olmsted. This was the first major work on which the two collaborated. At that time it was considered to be one of the most architecturally significant designs for an asylum, a style that became known as Richardsonian Romanesque. Construction started in 1871 and the two imposing 185 foot towers of the Administration building have been a highly visible and striking landmark in north Buffalo since 1880. The central pavilion, with its lofty Gothic towers, adjacent wards A and B and the four flanking wards are all built of reddish-brown Medina sandstone that was quarried in Hulberton, Orleans County, New York. The heavy, rough-faced stone walls are set off by plainly finished blocks of the same material for doors and windows. In 1973, the State Hospital buildings were placed on the National Register of Historic Places of the National Park Service, and in 1986, the buildings were named a National Historic Landmark. The buildings were little used during the 1990’s, falling into disrepair and their fate was uncertain. However, thanks to New York State funds and the creation of the Richardson Center Corporation, a master plan for rehabilitation was developed. These significant Medina Sandstone structures will soon become a mixed use campus starting with a boutique hotel, event and conference space and an architecture center. Saint Bernard’s Seminary is an historic Roman Catholic complex consisting of four interconnected buildings designed by noted Rochester architect Andrew Jackson Warner and built between 1891 and 1908. All four buildings are constructed of an exceptionally distinctive variety of Medina Sandstone quarried at nearby Hanford’s Landing in the Genesee gorge. This sandstone is red with large, very distinct inclusions of white. The buildings share a Victorian Gothic style of architecture with stone walls and brick trim. The decorative brick trim is exceptionally artistic and complementary to the sandstone walls. The seminary complex was listed on the National Register of Historic Places in 1996. The former seminary buildings on Lake Avenue, after a period of vacancy, were turned into St. Bernard’s Park (subsidized apartments for senior citizens) and Park Place at St. Bernard’s (an adult day care program). Built in 1902, this beautiful church, its rectory and school building are all made of locally quarried brown Medina Sandstone. The Irish were the principal communicants of this congregation in the mid-nineteenth century. 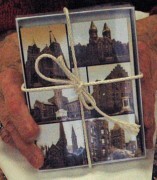 They were integral in the founding and building of this church. This parish complex, which was the center of the ethnic community at the time, is a vestige of their sacrifice and unrefutable contribution to the culture and heritage of their community. The church is an important example of late nineteenth century Gothic Revival style and includes a beautiful 170 foot spire, clad in the original Vermont Slate. This sandstone complex is also significant for its association with the period of growth and prosperity experienced by the Village of Medina during the early twentieth century. The young and fast growing city of Buffalo watched the construction of its first major architectural landmark starting in the spring of 1850. St. Paul’s Cathedral was designed by Richard Upjohn just a few years after he earned a national reputation for his design of the Trinity Episcopal Church in New York City. Upjohn himself is said to have regarded St. Paul’s as his finest church. The Gothic Revival style church was largely completed late in 1851 although construction of the signature 274 foot spire and smaller bell tower continued through 1870. The church is constructed of red Medina Sandstone set in a random ashlar pattern. The stone was brought to Buffalo on the Erie Canal from a quarry near Hulberton, N Y, which was owned by the parish. In May of 1888, the cathedral was largely destroyed in a gas explosion and resulting fire. The interior was destroyed, but the Medina Sandstone walls remained solid. This disaster bolstered the reputation of Medina Sandstone as a durable and fire resistant building material. Working within these solid sandstone walls the church interior was reopened in 1890. 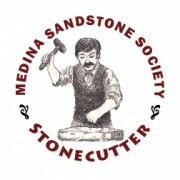 The Medina Sandstone Society is proud to recognize these exceptional examples of Medina Sandstone construction in all of these buildings that are such an important part of Medina, Albion, Rochester and Buffalo’s past and its future.